Chemokine (CC motif) receptor-like 2 (CCRL2) binds leukocyte chemoattractant chemerin and can regulate local levels of the attractant, but does not itself support cell migration. In this study, we show that CCRL2 and VCAM-1 are upregulated on cultured human and mouse vascular endothelial cells (EC) and cell lines by proinflammatory stimuli. CCRL2 induction is dependent on NF-κB and JAK/STAT signaling pathways, and activated endothelial cells specifically bind chemerin. In vivo, CCRL2 is constitutively expressed at high levels by lung endothelial cells and at lower levels by liver endothelium; and liver but not lung EC respond to systemic LPS injection by further upregulation of the receptor. Plasma levels of total chemerin are elevated in CCRL2−/− mice and are significantly enhanced after systemic LPS treatment in CCRL2−/− mice compared with wild-type mice. Following acute LPS-induced pulmonary inflammation in vivo, chemokine-like receptor 1 (CMKLR1)+ NK cell recruitment to the airways is significantly impaired in CCRL2−/− mice compared with wild-type mice. In vitro, chemerin binding to CCRL2 on endothelial cells triggers robust adhesion of CMKLR1+ lymphoid cells through an α4β1 integrin/VCAM-1–dependent mechanism. In conclusion, CCRL2 is expressed by EC in a tissue- and activation-dependent fashion, regulates circulating chemerin levels and its bioactivity, and enhances chemerin- and CMKLR1-dependent lymphocyte/EC adhesion in vitro and recruitment to inflamed airways in vivo. Its expression and/or induction on EC by proinflammatory stimuli provide a novel and specific mechanism for the local enrichment of chemerin at inflammatory sites, regulating the recruitment of CMKLR1+ cells. Chemerin is a chemotactic protein for dendritic cell subsets, macrophages, and NK cells (1–3). Chemerin circulates in an inactive proform: activation of chemerin requires proteolytic processing of the carboxyl terminus and removal of inhibitory amino acids (4–7). We and others identified chemerin as a natural nonchemokine chemoattractant ligand for chemokine-like receptor 1 (CMKLR1), and in a recent publication, we “de-orphaned” an additional second receptor for chemerin, serpentine chemokine (CC motif) receptor-like 2 (CCRL2) (3, 5, 8–10). Interestingly, although both CCRL2 and CMKLR1 bind chemerin with high affinity, the downstream functional consequences of ligand binding are quite different. Chemerin binding to CMKLR1 triggers calcium mobilization, receptor and ligand internalization, and cell migration. Alternatively, chemerin binding to CCRL2 does not induce intracellular calcium flux or ligand internalization, but can regulate chemerin bioavailability (3, 10). A third high-affinity chemerin receptor, G protein-coupled receptor 1 (GPR1), has also been recently reported, although it also does not itself support chemerin-dependent cell migration (8). Chemoattractants recruit leukocytes to inflamed tissues in part by triggering integrin-dependent adhesion to activated vascular endothelium. Several teams reported the colocalization of chemerin with vascular endothelial cells (EC) in multiple inflammatory disorders, such as multiple sclerosis, lupus, and psoriasis, and in endothelial venules of secondary lymphoid tissues (11–14). Although several human EC lines express CMKLR1 and can respond to chemerin in an angiogenesis assay, CCRL2 has not yet been fully investigated in EC biology (15). Given the reported association of chemerin with vascular EC and the potential role of nonclassical chemoattractant receptor CCRL2 in augmenting local chemerin levels, we characterized the expression, regulation, and function of CCRL2 on human and murine vascular EC (10). In this study, we report that proinflammatory stimuli upregulate atypical chemerin receptor CCRL2 and VCAM-1 on EC via NF-κB and JAK/STAT intracellular signaling pathways. 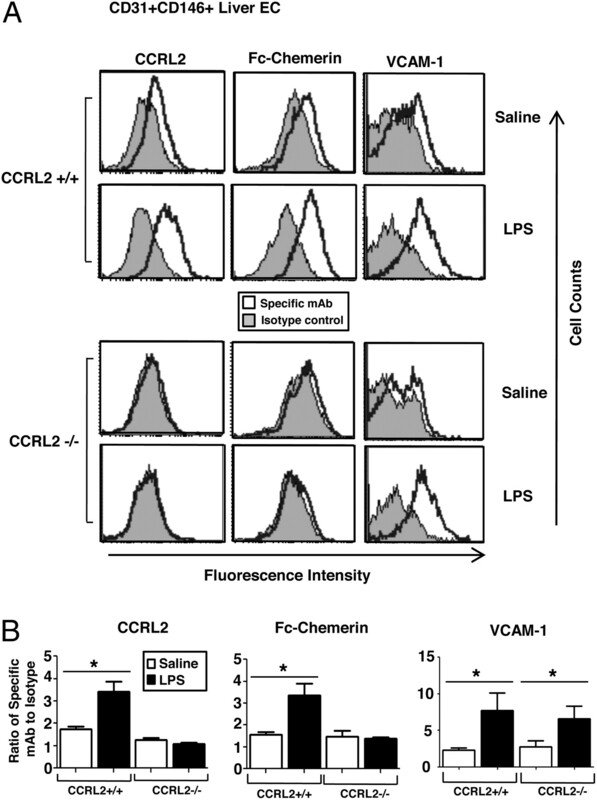 Plasma chemerin levels are significantly elevated in CCRL2−/− mice following systemic LPS injection compared with wild-type (WT) mice and untreated controls, implicating CCRL2 in the regulation of circulating chemerin during inflammation. In an in vivo pulmonary inflammation model, recruitment of CMKLR1+ NK cells into the airways is impaired in CCRL2−/− mice. In vitro, chemerin binding to CCRL2+ EC triggers robust adhesion of CMKLR1+ lymphoid cells via α4β1 integrin/VCAM-1–mediated sticking. Thus, CCRL2 on EC acts in concert with CMKLR1 to coordinate chemerin-dependent leukocyte adhesion in vitro and recruitment in vivo. CCRL2−/− mice were obtained from Lexicon (The Woodlands, TX) and backcrossed nine generations on the BALB/c background. WT BALB/c mice were obtained from The Jackson Laboratory (Sacramento, CA). IL-1, IL-2, IL-4, IL-6, IL-10, IL-12, IL-13, IL-17, IL-23, CXCL12, GM-CSF, VEGF, Netrin-4, FLT3L, TGF-β, IFN-γ, TNF-α, and chemerin were purchased from R&D Systems (Minneapolis, MN). Lipoteichoic acid (TLR2), flagellin (TLR5), R837 (TLR7), CpGa (TLR9), LPS (TLR4), polyinosinic-polycytidylic acid (poly(I:C); TLR3) were purchased from InvivoGen (San Diego, CA). Vitamin D3, Vitamin D2, and dexamethasone were obtained from Sigma-Aldrich (Saint Louis, MO, USA). IFN-α, IFN-β were obtained from PBL InterferonSource (Piscataway, NJ, USA). Anti-mouse (m) Abs included anti-mCCRL2 (clone BZ2E3, generated in-house), rat IgG2a isotype control (clone 9B5, generated in-house), anti-mCMKLR1 (clone BZ194, generated in-house, rat IgG2a; clone BZ186, generated in-house, mIgG1), anti-mGPR1 (clone BZ48, generated in-house, rat IgG2a), and anti-mVCAM-1 (clone MK2.7, generated in-house, rat IgG1). Anti–mCD31-PE-Cy7, anti–mCD146-FITC, anti–mVCAM-1-allophycocyanin (clone 429) were purchased from BioLegend (San Diego, CA), and anti–CD3-PE-Cy7, anti–Ly6G-FITC, and anti–DX5-PE were purchased from eBioscience (San Diego, CA). Anti-human (h) Abs included anti–hCMKLR1 (clone BZ332, generated in-house), anti–hGPR1 (clone BZ1274, generated in-house, rat IgG2b); anti–hVCAM-1-FITC (clone IE10), mIgG2b-FITC isotype control, and mouse anti-hCCRL2 (clone 152211) were purchased from R&D Systems. Secondary Abs include goat anti-rat IgG-PE (R&D Systems), goat anti–hIgG-PE, rat anti–mIgG-PE (Invitrogen, Carlsbad, CA), and goat anti-mouse IgG-Alexa 488 (Molecular Probes, Carlsbad, CA). Primers specific for mVCAM-1, hVCAM-1, and hCMKLR1 were purchased from SABiosciences (Valencia, CA, USA). Primer sequences for mGPR1, hGPR1, and hCCRL2 are as follows: mGPR1 (forward, 5′-GGAGCTCAGCATTCATCACA-3′, reverse, 5′-GACAGGCTCTTGGTTTCAGC-3′), hGPR1 (forward, 5′-AATGCCATCGTCATTTGGTT-3′, reverse, 5′-CAACTGGGCAGTGAAGGAAT-3′), and hCCRL2 (forward, 5′-GAGGCAGAGCAATGTGACAA-3′, reverse, 5′-ATTTTTCCACGCGTTTGAGTC-3′). Primers for mCCRL2, mCMKLR1, mouse chemerin, human chemerin, and human β-actin were used as previously described (10, 16, 17). Inhibitors included IKKβ phopshorylation inhibitor BAY-11-7082 (Calbiochem, Gibbstown, NJ) and JAK-1 inhibitor sc-204021 (Santa Cruz Biotechnology, Santa Cruz, CA). Mouse liver and lung EC were isolated from BALB/c WT and CCRL2−/− mice. Briefly, livers and lungs were isolated from 8- to 10-wk-old mice and digested in 5 mg/ml PBS/collagenase IV (Worthington, Lakewood, NJ) for 45 min at 37°C. Digested tissue was passed over cell strainers of decreasing size (100, 70, and 40 μM) and then centrifuged for 10 min at 300 × g at 4°C. Endothelial cells were enriched using 30% HistoDenz/RPMI 1640 solution (Sigma-Aldrich); after centrifugation at 1500 × g for 20 min at 4°C, cells at the interface were collected and stained with CD31 and CD146 (both from BioLegend) to identify the purified endothelial cell population. bEND.3 cells were grown in DMEM media (Life Technologies, Carlsbad, CA) supplemented with pyruvate, nonessential amino acids, l-glutamine, penicillin-streptomycin, and 10% FBS. For inhibitor experiments, bEND.3 cells were preincubated with the indicated concentration of inhibitor for 1 h, after which fresh media with or without inhibitor with the indicated cytokines were added to the cells and incubated for an additional 24 h. HEK293 and L1.2 cells (pre-B cell mouse lymphoma) were grown in RPMI 1640 supplemented with pyruvate, nonessential amino acids, l-glutamine, penicillin-streptomycin, and 10% FBS and G418 (Life Technologies). HUVEC and human dermal microvascular EC (HDMEC) were purchased from Lonza (Basel, Switzerland), and a novel human brain microvascular endothelial cell line, hCMEC/D3, was a gift from Prof. P.O. Couraud (Université René Descartes, Paris, France) (18). Briefly, cells were seeded at a concentration of 10,000 cells/ml on 0.02% gelatin-coated plates. EBM media (Lonza) was changed every other day, and after 7 d confluent cells were ready for experimentation. Twenty-four hours prior to stimulation, cells were cultured in EBM base media containing reduced concentrations of supplemental growth factors. Total RNA was extracted from cells using an RNeasy kit (Qiagen, Valencia, CA), after which the total RNA concentration was measured using the Nanodrop spectrophotometer ND-100. Reverse transcription quantitative PCR (RT-qPCR) was performed using RT/Taq/SYBR Green qPCR reagents (Invitrogen) using a Stratagene Mx3000p thermocycler (Agilent Technologies, Santa Clara, CA). Primers were validated using stringent criteria by verifying that the dissociation curve showed only one peak, and “no reverse transcriptase” controls were used to confirm that qPCR results reflected RNA expression and not genomic DNA contamination. Gene expression was normalized to CDC42 for mouse samples and β-actin for human samples. The relative induction value of our genes of interest was calculated using the 2−ΔΔCt method (19). All PCR reactions were done in duplicate. A total of 0.5 million cells were used for each staining. For unconjugated Abs, cells were incubated with the indicated primary Abs at 4°C for 30 min in 100 μl PBS/2% FBS/2% mouse serum. Cells were then washed with PBS and centrifuged for 3 min at 2000 rpm. Following the washing step, cells were incubated with secondary goat anti-rat PE (R&D Systems) in 50 μl PBS/2% FBS/2% goat serum. For directly conjugated Abs, cells are incubated with labeled Ab at 4°C for 30 min in 100 μl PBS/2% FBS/2% mouse serum. Cells were washed and centrifuged for 3 min at 2000 rpm, resuspended, and fixed in 200 μl PBS/1% paraformaldehyde and were analyzed using a FACSCalibur (BD Biosciences, Franklin Lake, NJ). For radioligand binding assays, radioiodinated chemerin (residues 21–148; R&D Systems; custom radiolabeling performed by PerkinElmer) was provided as a gift from J. Jaen (ChemoCentryx, Mountain View, CA). To assess the ability of chemerin to bind to bEND.3 cells treated with cytokines, 5 × 104 cells per well were mixed with 4-fold dilutions of unlabeled chemerin competitor and ∼1 nM (0.025 μCi) [125I]chemerin tracer per well in a total volume of 200 μl, and agitated at 4°C for 3 h. Levels of cell-bound radioactivity were determined by harvesting the cells on polyethyleneimine-treated GF/B glass filters (PerkinElmer, Waltham, MA) using a cell harvester (PerkinElmer), washing the filters twice with buffer (25 mM HEPES, 500 mM NaCl, 1 mM CaCl2, and 5 mM MgCl2, adjusted to pH 7.1) and measuring the amount of [125I]chemerin bound to each filter (cpm) with a TopCount scintillation counter (PerkinElmer). Recombinant Fc-chemerin protein (residues 23–156) was produced and purified from Chinese hamster ovary cells via transient transfection and protein A purification. A DNA fragment corresponding to bioactive mouse chemerin isoform ending in residue 156 (serine) was amplified by PCR and cloned in-frame downstream of human or mouse IgG1 Fc domain, which is downstream of a secretion signal peptide in mammalian expression vector pLEV113 (LakePharma, Belmont, CA). There is a 9-aa glycine-rich linker between the Fc and chemerin domain. Plasmid DNA was transfected into Chinese hamster ovary cells using Lafectine transfection reagent (LakePharma), and cell culture supernatant was collected 3–5 d after transfection. Fc fusion proteins were purified with protein A resins (MabSelect SuRe; GE Healthcare), and final proteins were formulated in 100 mM Tris (pH 7.5), 150 mM NaCl, and 0.45% NaOAc. To assess the ability of CCRL2 on bEND.3 cells to induce adhesion, bEND.3 cells were grown to confluence in 96-well petri dishes. After 24 h treatment with TNF-α/LPS/IFN-γ (20 ng/ml, 1μg/ml, and 50 ng/ml, respectively), bEND.3 cells were loaded with 50 μl 200 nM chemerin in PBS/0.1% BSA and incubated at 37°C for 30 min. This step serves to load CCRL2 with chemerin. The cells are then washed with PBS to remove unbound chemerin. L1.2-CMKLR1+ cells (100 μl) at a concentration of 5 × 106 cells/ml, prelabeled with calcein AM (BD Biosciences), were placed on top of the bEND3 cells and coincubated for 30 min at 37°C. The cells were washed twice with PBS without calcium and magnesium. The number of cells that adhered to the monolayer was then measured by a plate reader at an emission/excitation of 494/517 nm. Images of adherent cells were taken using a fluorescent microscope. Blocking Abs against VCAM-1 (MK2/7) and α4β1 integrin (PS/2) were used at a concentration of 10 μg/ml. Mice were injected i.p. with LPS (12 mg/kg), euthanized 12 h later, and blood was collected by cardiac puncture. Plasma chemerin concentrations were measured by ELISA (R&D Systems). HEK293 cells transfected with hCMKLR1 or hCCRL2, bEND.3 cells, and HUVEC were used for chemerin internalization assays. One hundred thousand cells per well were incubated with mFc-human chemerin for 30 min at 4°C and then washed with cold PBS to remove unbound chemerin. For the microscopy studies, HEK293 transfectants and bEND.3 cells were incubated with secondary Ab goat anti-mouse IgG Alexa 488 (Molecular Probes). After 20 min incubation at 4°C the cells were washed in cold PBS. Subsequently, cells were either placed back at 4°C or incubated at 37°C to allow for labeled Fc-chemerin to internalize. After a final wash in cold PBS, cells were fixed in PBS/1% paraformaldehyde and spun down on microscope slides by cytospin. Fc-chemerin internalization was analyzed by epifluorescence microscopy. For the flow cytometry studies, Fc-chemerin–loaded HUVEC were incubated at 4°C or 37°C for 30 min, washed, and then stained with secondary Ab goat anti-mouse PE. Fc-chemerin internalization was analyzed by flow cytometry. WT and CCRL2 knockout mice were anesthetized and dosed with 1 μg LPS in 50 μl saline by intranasal injection. Twelve hours after LPS injection the mice were euthanized and the leukocytes that accumulated in the airways were collected by bronchoalveolar lavage (BAL). After mice were euthanized, a blunt needle was inserted in the exposed trachea. The airway of the mice was washed three times with 1 ml PBS. The recovered fluid was centrifuged, and the recovered leukocytes in the BAL fluid were directly stained with surface markers for T cells (CD3), neutrophils (Ly6G), and NK cells (DX5). Blood was collected by cardiac puncture after euthanasia and directly mixed with 5 ml PBS without Ca2+/Mg2+ supplemented with 4 mM EDTA to prevent clotting. An equal volume of 2% dextran T-500 in PBS was added, and the solution was gently mixted by inversion and incubated at 37°C for 45 min. The supernatant was collected and centrifuged and incubated with 2 ml RBC lysis buffer (Sigma-Aldrich). The pelleted WBCs were then stained and analyzed by flow cytometry. mCMKLR1/L1.2 cells were used to assess chemerin bioactivity by in vitro transwell migration as previously described (3). For migration experiments, 2.5 × 105 mCMKLR1/L1.2 cells in 100 μl chemotaxis media (either RPMI 1640 plus 10% FCS for prochemerin activation experiments, or RPMI 1640 plus 0.5% BSA for detection of bioactive chemerin in the absence of proteases) were added to the top wells of 5-μm pore transwell inserts (Corning Costar, Lowell, MA), and 25 μl plasma samples in 600 μl media were added to the bottom wells. After incubating the transwell plates for 2 h at 37°C, the bottom well cells were harvested and flow cytometry was used to assess migration. To test the amount of prochemerin in the plasma samples, 25 μl plasma was incubated with 5 μl plasmin (1 mg/ml, reconstituted in PBS) for 5 min at 37°C, and then immediately diluted in 600 μl cold chemotaxis media (RPMI 1640 plus 10% FBS). Evaluation of significance was performed using a Student t test or ANOVA followed by a Bonferroni posttest. Statistical tests were calculated using the Instat statistical program (GraphPad Software, La Jolla, CA), and graphs were plotted using Prism graphing software (GraphPad Software). Data are expressed as means ± SD or SEM as indicated, and a p value of <0.05 was considered to be significant. Given the reported colocalization of chemerin with activated EC in multiple inflammatory diseases, we tested a panel of cytokines and TLR ligands for CCRL2 induction in bEND.3 endothelioma cells, a model cell line of mouse brain vascular EC (11–14, 20). A subset of proinflammatory cytokines and TLR ligands [TNF-α, LPS, IFN-γ, IL-1β, IFN-β, and poly(I:C)] induced CCRL2 protein expression (Fig. 1A, 1B). The cytokines and factors that upregulated CCRL2 were similar to those that induced VCAM-1, although optimal upregulation of CCRL2 required synergistic activity of TNF-α with other stimuli (e.g., IFN-γ and LPS), whereas VCAM-1 was highly induced by TNF-α alone (Fig. 1C, 1D); the latter observation is consistent with previous reports (20). Chemerin receptors CMKLR1 and GPR1 were not expressed under any condition, whether assessed by Ab staining or RNA analysis (data not shown). Selective upregulation of CCRL2 and VCAM-1 in endothelioma cells by proinflammatory stimuli. CCRL2 (A) and VCAM-1 (B) protein expression was measured by flow cytometry on mouse brain endothelioma cells (bEND.3) treated for 24 h with the indicated soluble inflammatory mediators. 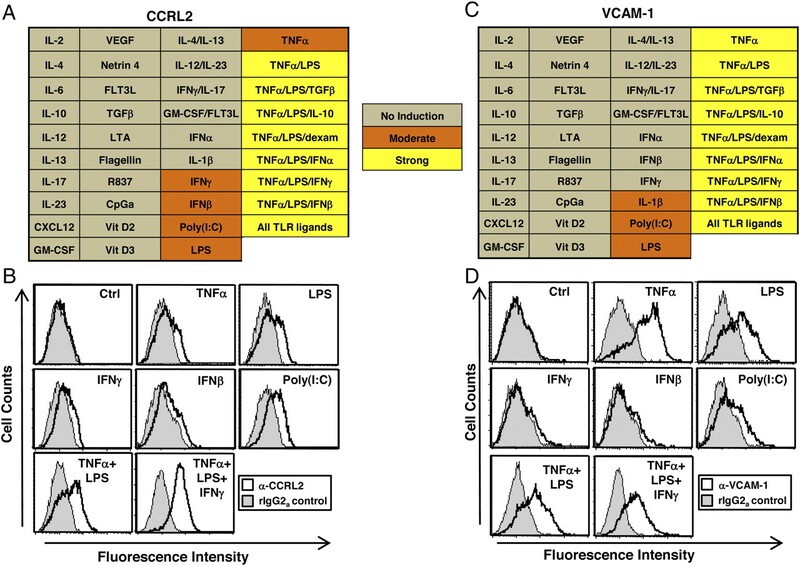 The induction of CCRL2 and VCAM-1 is represented as a heat map. Histogram plots of CCRL2 (C) and VCAM-1 (D) are representative of the induction of CCRL2 and VCAM-1. Results are representative of three independent experiments. 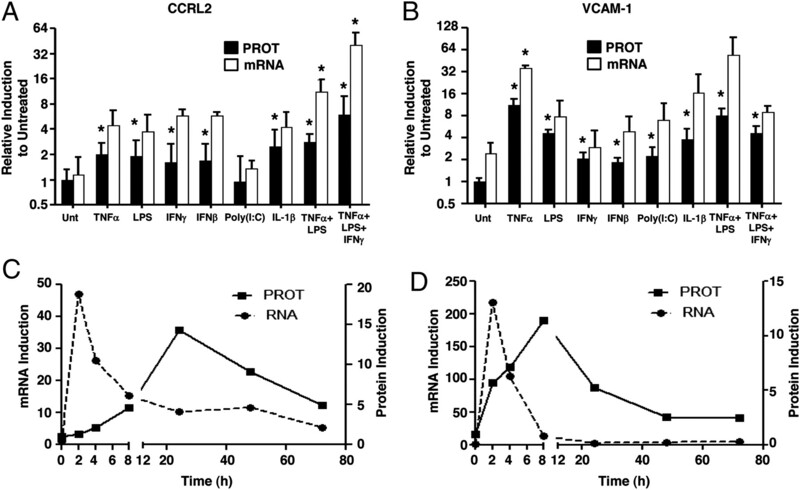 Consistent with the protein expression analysis, CCRL2 and VCAM-1 RNA were upregulated by proinflammatory stimuli (Fig. 2A, 2B). We next examined the RNA and protein induction kinetics of CCRL2 and VCAM-1 following treatment with TNF-α, LPS, and IFN-γ (Fig. 2B, 2D). RNA expression for both CCRL2 and VCAM-1 occurred rapidly and peaked after just 2 h for each. Despite similar RNA induction kinetics, CCRL2 protein expression peaked at 24 h after treatment, whereas VCAM-1 surface expression peaked at 8 h (Fig. 2C, 2D). Kinetic analysis of CCRL2 and VCAM-1 induction. CCRL2 (A) and VCAM-1 (B) mRNA and protein induction was measured in bEND.3 cells treated with the indicated cytokines for 24 h. The means of three different experiments ± SD are shown. TNF-α plus LPS plus IFN-γ were incubated with bEND.3 cells for the indicated times. At each time point CCRL2 (C) and VCAM-1 (D) induction was measured by either RT-qPCR (normalized to CDC42) or by mAb staining and flow cytometry. Datum points represent the mean of two to three experiments. *p < 0.05 by t test. The robust and synergistic induction of CCRL2 by the combination of TNF-α, LPS, and IFN-γ in bEND.3 cells prompted us to investigate the intracellular pathways involved. Previously, it was shown that TNF-α and LPS trigger the intracellular NF-κB pathway in EC, whereas IFN-γ activates the JAK-1/STAT-1 pathway; however, more recent evidence indicates that TNF-α and LPS can also activate the STAT-1 pathway, and, conversely, that IFN-γ can indirectly stimulate the NF-κB pathway (21–23). To test the role of NF-κB and JAK-1/STAT-1 in the upregulation of CCRL2, we used pharmacoinhibitors of the NF-κB pathway (BAY 11-7082) and of the JAK-1/STAT-1 pathway (sc-204021). The NF-κB inhibitor almost completely prevented the induction of CCRL2 in bEND.3 cells by TNF-α, LPS, and poly(I:C), but only partially inhibited IFN-γ– or IFN-β–dependent CCRL2 induction (Fig. 3). Alternatively, the JAK-1 inhibitor marginally inhibited TNF-α–, LPS-, IL-1β–, or poly(I:C)-induced induction of CCRL2, but almost completely blocked IFN-γ– or IFN-β–dependent CCRL2 induction (Fig. 3). Cells treated with NF-κB or JAK inhibitors only partially blocked CCRL2 induction when TNF-α, LPS, and IFN-γ were combined together. However, the combination of both NF-κB and JAK-1 inhibitors almost completely blocked CCRL2 induction by combined TNF-α, LPS, and IFN-γ, suggesting that both pathways are involved and that they can independently and synergistically upregulate endothelial CCRL2 (Fig. 3). NF-κB and JAK/STAT signaling pathways regulate CCRL2 induction in EC. Mouse bEND.3 cells were preincubated with IKKβ inhibitor BAY (11-7082) and/or with JAK-1 inhibitor (sc-204021) followed by incubation with the indicated cytokines and TLR ligands. CCRL2 protein expression was measured by flow cytometry. Blocking of CCRL2 induction by specific inhibitors is displayed as a percentage inhibition. The means of five to eight different experiments ± SD are shown. *p < 0.05 by t test. Excess unlabeled chemerin inhibited the binding of either [125I]chemerin (IC50, 3 nM; Fig. 4A) or Fc-chemerin (IC50, 8 nM; Fig. 4B) to bEND.3 cells treated with proinflammatory stimuli. Chemerin did not bind to unstimulated bEND.3 cells (Fig. 4). Chemerin binds to activated bEND.3 cells. bEND.3 cells were activated with TNF-α plus LPS plus IFN-γ for 24 h and incubated with either [125I]chemerin (A) or Fc-chemerin (B) in the presence of various concentrations of unlabeled chemerin competitor. The mean of triplicate wells ± SD is shown for each experiment. Data shown are representative of three individual experiments with similar results. Primary human umbilical vein and dermal microvascular EC (HUVEC and HDMEC, respectively), as well as a human brain endothelial cell line (hCMEC/D3), significantly upregulated CCRL2 RNA following exposure to TNF-α, LPS, and IFN-γ (Fig. 5A). VCAM-1 RNA was also significantly upregulated as anticipated (data not shown). 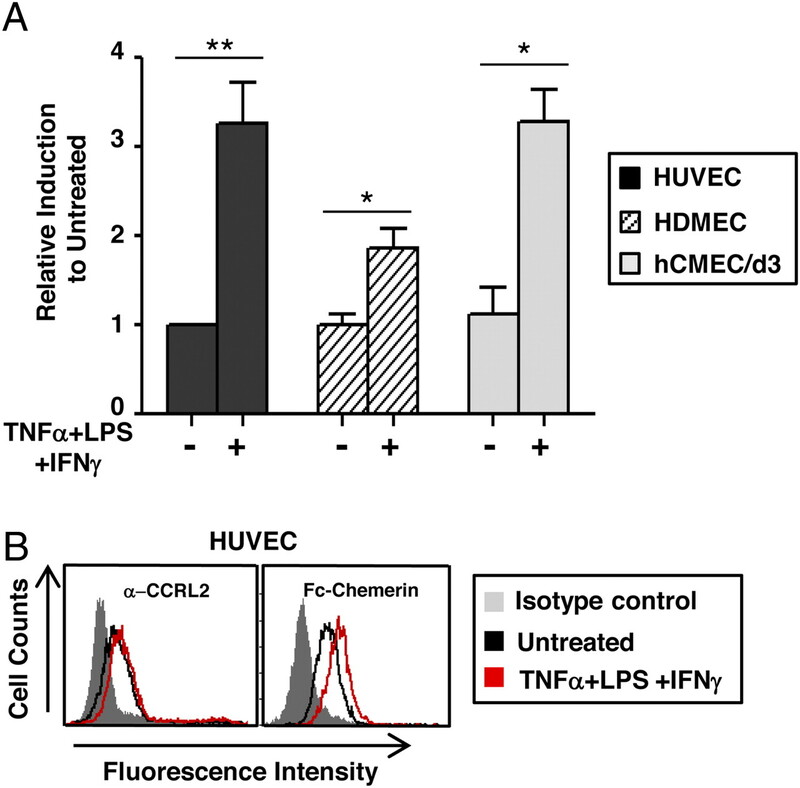 Furthermore, unstimulated HUVEC expressed CCRL2 protein and bound Fc-chemerin, and stimulation with TNF-α, LPS, and IFN-γ slightly increased CCRL2 protein expression and Fc-chemerin binding (Fig. 5B). Human endothelial cells upregulate CCRL2. HUVEC, HDMEC, and a human brain endothelial cell line (hCMEC/d3) were incubated for 24 h with TNF-α plus LPS plus IFN-γ. (A) Induction of CCRL2 RNA was measured in all samples by RT-qPCR normalized to β-actin. The means of three different experiments ± SD are shown. (B) HUVECs were either untreated or treated with TNF-α plus LPS plus IFN-γ for 24 h and stained for CCRL2 expression and Fc-chemerin binding. Results are representative of three individual experiments with similar results. *p < 0.05, **p < 0.01 by t test. We next asked whether CCRL2 was expressed on freshly isolated mouse vascular lung and liver EC, as these organs provided an adequate quantity of primary EC for analysis. Interestingly, CD31+CD146+ mouse lung EC expressed high levels of CCRL2 in the absence of experimental exogenous activation, and mouse liver EC were moderately positive. Abs against CCRL2 failed to stain lung or liver EC from CCRL2-deficient mice, confirming the specificity of the Ab staining. We did not detect any genotype-dependent differences in VCAM-1, CD31, or CD146 expression on lung or liver EC, suggesting that overall the endothelial cell phenotype is not altered in the CCRL2-deficient animals (Fig. 6). CCRL2 protein expression in mouse primary EC. After collagenase digestion and endothelial enrichment by density gradient, lung (A) and liver (B) EC from WT and CCRL2−/− mice were evaluated for CCRL2 expression. CD31 and CD146 were used to identify EC by flow cytometry. Data shown are representative of three different experiments with similar results. LPS injection activates vascular EC in vivo (24, 25). To determine whether endothelial CCRL2 is induced by LPS in vivo, we injected mice systemically with endotoxin, isolated vascular EC from liver and lung, and assessed CCRL2 and VCAM-1 expression and chemerin binding by flow cytometry. CD31+CD146+ liver EC from LPS-injected WT mice significantly upregulated CCRL2 and bound to Fc-chemerin, whereas similar cells from saline-injected WT mice were CCRL2low (Fig. 7). LPS injection had no effect on CCRL2 expression or Fc-chemerin binding to WT lung EC relative to isotype control staining (Fig. 8). Furthermore, neither CCRL2 Ab nor Fc-chemerin stained liver or lung EC from LPS-injected or control CCRL2−/− mice (Figs. 7, 8). Consistent with previous reports, LPS injection upregulated VCAM-1 on liver and lung EC in both genotypes (Figs. 7, 8) (24, 26–29). CCRL2 upregulation on mouse liver EC following LPS injection in vivo. WT or CCRL2−/− mice were injected i.p. with LPS. EC from the liver were isolated 12 h later, enriched, and identified by costaining for CD31 and CD146. (A) The surface expression of CCRL2 (mAb staining and Fc-chemerin binding) and VCAM-1 (mAb staining) were determined by flow cytometry. The dataset shown is representative of three to six individual experiments with similar results. (B) Induction of CCRL2, Fc-chemerin, and VCAM-1 in LPS-treated mice was quantified by normalizing the specific Ab mean fluorescence intensity value to its isotype mean fluorescence intensity value. The mean ± SEM is shown. Each graph represents three to six independent experiments pooled together (n = 1–2 mice/group/experiment). *p < 0.05 by t test. LPS injection does not alter CCRL2 expression on mouse lung endothelial cells in vivo. WT or CCRL2−/− mice were injected i.p. with LPS. EC from the lung were isolated 12 h later, enriched, and identified by costaining for CD31 and CD146. (A) The surface expression of CCRL2 (mAb staining and Fc-chemerin binding) and VCAM-1 (mAb staining) were determined by flow cytometry. The dataset shown is representative of three to six individual experiments with similar results. (B) Induction of CCRL2, Fc-chemerin, and VCAM-1 in LPS-treated mice was quantified by normalizing the specific Ab mean fluorescence intensity value to its isotype mean fluorescence intensity value. The mean ± SEM is shown. Each graph represents three to six independent experiments pooled together (n = 1–2 mice/group/experiment). *p < 0.05 by t test. Given our previous data that CCRL2+ lymphoid cells do not internalize bound chemerin, we next asked whether CCRL2+ vascular EC also concentrated chemerin on the cell surface. CCRL2+ bEND.3 cells (treated with TNF-α, LPS, and IFN-γ) bound to Fc-chemerin, whereas untreated cells were negative for chemerin binding (Fig. 9A). Upon shifting the chemerin-loaded cells to an internalization-permissive temperature (37°C), the bEND.3 cells did not internalize bound ligand (Fig. 9A). 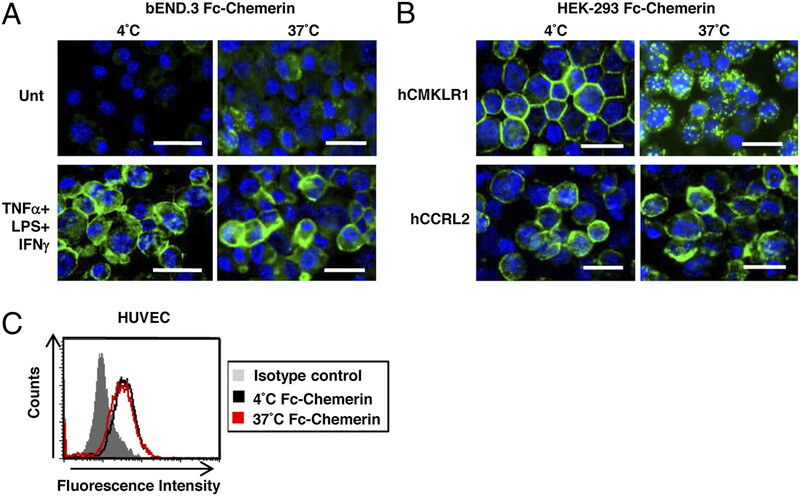 CCRL2+ HEK293 transfectants also did not internalize bound Fc-chemerin; however, CMKLR1+ HEK293 cells efficiently internalized bound Fc-chemerin when incubated at 37°C, as evidenced by the cytoplasmic puncti and lack of membrane staining (Fig. 9B). To determine whether these results extend to primary human EC, Fc-chemerin–loaded HUVEC (stimulated with TNF-α, LPS, and IFN-γ) were incubated at 4°C or 37°C, washed, and then stained for surface chemerin. The staining intensity of surface Fc-chemerin on HUVEC incubated at 37°C was similar to the staining intensity at 4°C, indicating that HUVEC did not internalize bound chemerin (Fig. 9C). CCRL2+ EC bind but do not internalize chemerin. HEK293 cells transfected with hCCRL2 or hCMKLR1 (A) as well as bEND.3 cells treated with or without TNF-α plus LPS plus IFN-γ (B) were preincubated with Fc-chemerin and goat anti-mouse IgG-Alexa 488 at 4°C, and then shifted to 4°C or 37°C. Internalization of fluorescently labeled Fc-chemerin was monitored by fluorescence microscopy. The dataset shown is representative of three individual experiments with similar results. Scale bars, 25 μm. (C) HUVEC pretreated for 24 h with TNF-α plus LPS plus IFN-γ were incubated with Fc-chemerin at 4°C for 30 min. Cells were washed to remove unbound chemerin and then shifted to either 4°C or 37°C for 30 min. Surface-bound Fc-chemerin was detected using rat anti-mouse IgG1-PE secondary Ab. Results are representative of three individual experiments with similar results. Given the constitutive expression of CCRL2 lung vascular EC and, to a lesser extent, liver vascular EC, we hypothesized that circulating chemerin levels may be altered in CCRL2−/− mice owing to the lack of chemerin sequestration in the vasculature. Indeed, plasma levels of total chemerin (measured by ELISA, which detects bioactive chemerin, prochemerin, and larger fragments of chemotactically inert chemerin) were slightly but significantly elevated in CCRL2−/− mice compared with WT mice (Fig. 10A). There was no significant difference in the level of bioactive plasma chemerin between WT and CCRL2−/− (Fig. 10B), and there was a slight but nonsignificant increase in prochemerin (detected by ex vivo proteolytic [plasmin] activation) in CCRL2−/− plasma compared with WT (Fig. 10C), as measured by in vitro CMKLR1+ cell migration. Interestingly, in mice dosed with endotoxin to induce systemic inflammation and vascular CCRL2 expression, total chemerin plasma levels were 2-fold higher in CCRL2−/− mice versus WT mice, and 2-fold higher than untreated CCRL2−/−controls (Fig. 10A). Although there was no difference in bioactive plasma chemerin levels between LPS-treated WT and CCRL2−/− mice (Fig. 10B), prochemerin levels in CCRL2−/− plasma were significantly elevated compared with those in WT mice (Fig. 10C). Taken together, these data indicate that the increase in total circulating chemerin in LPS-treated CCRL2−/− mice is due to an increase in prochemerin and possibly inactive chemerin fragments. Interestingly, plasma levels of bioactive chemerin and prochemerin were significantly reduced in LPS-treated WT mice compared with untreated controls (Fig. 10B, 10C). Although plasma from CCRL2−/− mice showed a similar trend, the differences did not reach significance (Fig. 10B, 10C). Thus, CCRL2 regulates circulating chemerin levels and its proteolytic processing in vivo during systemic inflammation. 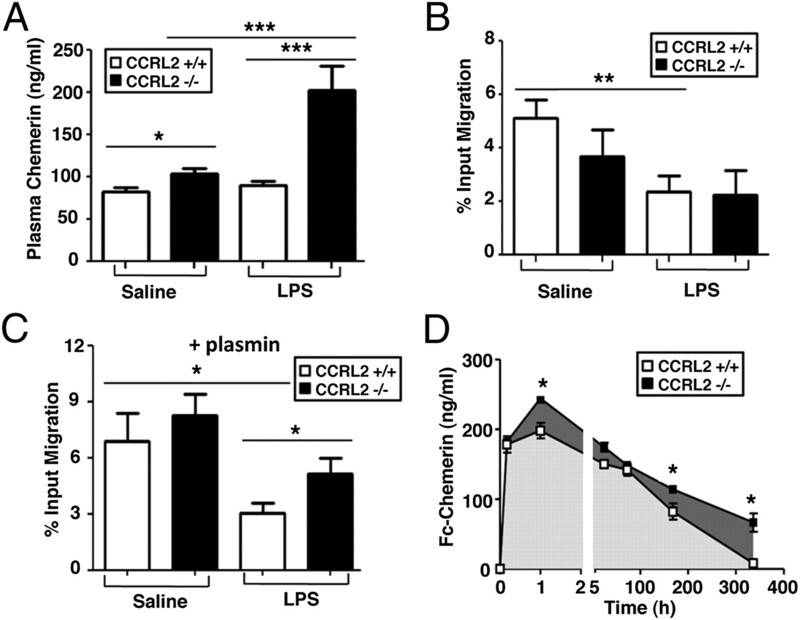 CCRL2 regulates circulating chemerin levels and its bioactivity in vivo. (A) WT and CCRL2−/− mice were either untreated or injected with 12 mg/kg LPS for 12 h, after which chemerin levels in plasma were measured by ELISA. For untreated mice, the means of n = 100 (WT) and n = 92 (CCRL2−/−) individual mice ± SEM are shown. For LPS-treated mice, the mean of six individual mice ± SEM is shown. *p < 0.05, ***p < 0.001 by t test. (B) The chemotactic bioactivity of plasma chemerin from WT and CCRL2−/− mice with or without LPS treatment was evaluated by in vitro mCMKLR1/L1.2 cell migration. **p < 0.01 by t test. (C) Plasma prochemerin levels were evaluated by preincubating plasma samples with plasmin to proteolytically activate chemerin and then assessing mCMKLR1/L1.2 cell migration. For (B) and (C), the mean of n = 9–10 mice ± SD is shown. *p < 0.05, **p < 0.01 by t test. Results are representative of two independent experiments. (D) Fc-chemerin (3 μg) was injected i.v. in WT or CCRL2−/− mice, and Fc-chemerin plasma levels were quantified at the indicated time points. The mean of n = 3 mice ± SD is shown. Statistical significance (*p < 0.05) was determined by ANOVA followed by a Bonferroni post hoc test. To isolate the role of vascular endothelium-expressed CCRL2 in regulating circulating chemerin levels, mice were injected i.v. with Fc-chemerin and the levels of plasma Fc-chemerin (as opposed to total chemerin) were measured over time. Plasma Fc-chemerin levels were significantly higher in CCRL2−/− mice compared with WT controls (area under the curve for CCRL2 mice, 40,540 ± 2,630 ng h/ml versus area under the curve for WT mice, 29,550 ± 1,240 ng h/ml; *p < 0.05 by t test; Fig. 10D). Intranasal injection of LPS causes acute lung inflammation and the accumulation of leukocytes into the broncheoalveolar space (30). Given the high level of CCRL2 expression and chemerin binding by lung EC, we used this pulmonary inflammation model to determine whether CCRL2 deficiency altered the accumulation of CMKLR1+ NK cells into inflamed airways. Although there were no genotype-dependent differences in the total number of BAL infiltrating leukocytes, T cells, or neutrophils, significantly fewer NK cells (measured as absolute number and as a percentage of total BAL leukocytes) accumulated in the airways of CCRL2−/− mice (Fig. 11A–C). 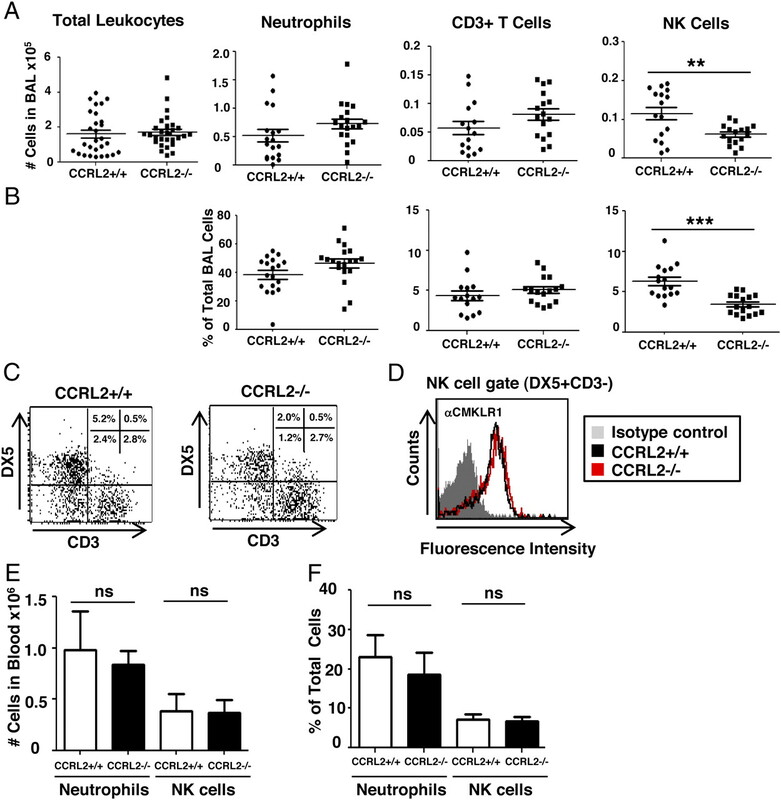 Blood NK cells from WT and CCRL2−/− mice expressed similar levels of CMKLR1 (Fig. 11D) and Fc-chemerin binding (data not shown), ruling out differential CMKLR1 receptor expression as a contributing factor in impaired airway NK cell trafficking in CCRL2−/− mice. NK cells themselves are CCRL2− (data not shown). Additionally, there were no differences in total numbers (or percentages) of circulating NK cells (or other major leukocyte subsets, such as neutrophils) between CCRL2−/− and WT mice (Fig. 11E, 11F, and data not shown). Thus, CCRL2 deficiency selectively impairs the recruitment of CMKLR1+ NK cells in an in vivo model of airway inflammation. Impaired in vivo recruitment of CMKLR1+ NK cells into inflamed airways in CCRL2−/− mice. Following intranasal LPS administration, BAL fluid from WT and CCRL2−/− mice was collected and cells were stained for neutrophils (Ly6G), T cells (CD3), and NK cells (DX5) and plotted either as absolute number of infiltrating cells (A) or as a percentage of total BAL leukocytes (B). Each graph represents three to four independent experiments pooled together (n = 15–29 mice per group; each symbol represents one mouse). (C) Representative flow cytometry dot plots of CD3 versus DX5 staining of BAL cells from WT and CCRL2−/− mice. (D) Blood NK cells (DX5+CD3−) from WT or CCRL2−/−mice were stained for CMKLR1. Representative histogram of n = 3 independent experiments. WBC were collected from WT and CCRL2−/− mice, stained for neutrophils (Ly6G) and NK cells (CD3−DX5+), and plotted either as absolute number (E) or as a percentage of total leukocytes (F) (n = 3 mice/group). **p < 0.01, ***p < 0.001 by t test. CCRL2 binds chemerin such that the critical cell-signaling carboxyl terminus remains exposed at the cell surface (10), and chemerin triggers CMKLR1+ macrophage adhesion by inducing α4β1 integrin clustering and binding to VCAM-1–coated plates (31). Because activated bEND.3 cells express high levels of both VCAM-1 and CCRL2 (Fig. 1), and L1.2 lymphoid cells express endogenous α4β1 integrin (32), we hypothesized that CCRL2 on bEND.3 cells could bind chemerin and trigger CMKLR1+ L1.2 cell adhesion (33). Using a static endothelial adhesion assay, we compared the ability of WT or CMKLR1+ L1.2 cells to adhere to untreated or activated CCRL2+ bEND.3 cells in the presence or absence of chemerin. Activated CCRL2+ EC loaded with chemerin triggered significant and robust adhesion of CMKLR1+ L1.2 cells compared with unstimulated CCRL2− EC (Fig. 12A, 12B). WT L1.2 cells did not adhere to the endothelial monolayer under any condition tested, and chemerin was required for adhesion triggering (Fig. 12A). Blocking Abs against α4 integrin or VCAM-1 abolished chemerin-dependent CMKLR1+ cell adhesion to CCRL2+-activated endothelium, confirming that the adhesion molecules that mediate cell sticking in this model are α4β1 integrin and VCAM-1 (Fig. 12C). Chemerin is associated with vascular endothelium in the affected tissues of multiple inflammatory disorders, such as multiple sclerosis, lupus, and psoriasis (11–14), but little is known regarding the regulation and role of its receptors on EC. In this study, we show that in a variety of EC, CCRL2, a high-affinity chemerin receptor, is either constitutively expressed (lung EC, liver EC, and HUVEC) and/or induced (bEND.3, hCMEC/D3, HDMEC, HUVEC, and liver EC) by proinflammatory stimuli. As with lymphoid cell-expressed receptor, CCRL2 on EC binds chemerin but does not internalize the ligand. Chemerin bound to CCRL2+ EC triggered robust adhesion of CMKLR1+ lymphoid cells via α4β1 integrin/VCAM-1 interactions (illustrated in Fig. 12D). In vivo, CCRL2 deficiency resulted in selective impairment of CMKLR1+ NK cell accumulation into the airways following experimental pulmonary inflammation. Thus, our data suggest that CCRL2 on EC functions to increase local concentrations of chemerin and recruit CMKLR1+ cells to sites of inflammation. CCRL2+-activated EC bind chemerin and trigger CMKLR1+ cell adhesion. (A) Mouse bEND.3 cells were untreated or treated with TNF-α plus LPS plus IFN-γ, loaded with chemerin, and then coincubated with WT or CMKLR1+ L1.2 lymphoid cells prelabeled with calcein AM. The mean of quintuplet wells ± SD of n = 3 independent experiments with similar results is shown. (B) Fluorescence microscopy of adherent CMKLR1+ cells. Panels show adhesion of L1.2-CMKLR1+ cells to bEND.3 cells treated with or without TNF-α plus LPS plus IFN-γ and with or without chemerin. Representative images of n = 3 different experiments are shown. Scale bars, 25 μm. (C) Left panel, Inhibition of L.12-CMKLR1+ cell adhesion to bEND.3 cells was evaluated by preincubating L1.2-CMKLR1+ cells either with PBS, rat IgG isotype control, or with rat anti-mouse α4 integrin. Right panel, Inhibition of L.12-CMKLR1+ cell adhesion to bEND.3 cells was evaluated by preincubating bEND.3 cells with either PBS, rat IgG isotype control, or with rat anti-mouse VCAM-1. The mean of quintuplet wells ± SD of n = 3 independent experiments with similar results is shown. (D) Model summarizing the components involved in chemerin-dependent CMKLR1+ cell adhesion to CCRL2+ EC. ***p < 0.001 by t test. Although we tested an array of proinflammatory and immune suppressive cytokines, ILs, growth factors, and TLR ligands, only proinflammatory stimuli [TNF-α, IFN-γ, IFN-β, LPS, and poly(I:C)] induced CCRL2 on the mouse brain endothelial model cell line bEND3. Additionally, proinflammatory factors induced CCRL2 in three human endothelial model cell lines (HUVEC, HDMEC, and hCMEC/d3). We and others reported similar results for CCRL2 induction by mouse peritoneal macrophages and dendritic cells (8, 27), suggesting the involvement of shared pathways for CCRL2 regulation across cell types. Endothelial cells express TNF-αR, IFN-γR, IFN-βR, TLR4, and TLR3, consistent with responsiveness (as measured by CCRL2 or VCAM-1 induction) to their respective ligands (34–37). Combinations of proinflammatory mediators were significantly more robust in triggering CCRL2 induction than any individual stimuli (maximal response with TNF-α/LPS/IFN-γ), consistent with enhanced induction of CCRL2 on human neutrophils by cotreatment with TNF-α and IFN-γ (38), implying that multiple intracellular signaling pathways (NF-κB, JAK/STAT, and possibly others) work synergistically to regulate CCRL2 expression. Indeed, treating cells with pharmacoinhibitors targeting both NF-κB and JAK/STAT pathways significantly reduced CCRL2 induction by TNF-α/LPS/IFN-γ. 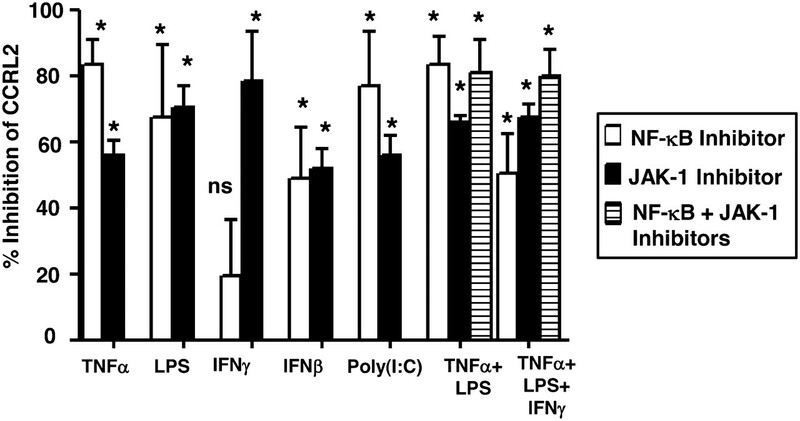 Furthermore, the addition of immune suppressive factors such as dexamethasone, TGF-β, or IL-10 failed to inhibit the TNF-α/LPS–stimulated induction of CCRL2 or VCAM-1, indicating that the proinflammatory signals are dominant (Fig. 1). To confirm that the endothelioma cell lines accurately reflected primary EC biology, we evaluated CCRL2 expression on freshly isolated lung and liver EC from mice dosed with endotoxin to induce systemic inflammation and vasculitis (24). Systemic administration of endotoxin has been reported to increase circulating levels of TNF-α and IFN-γ, mimicking to an extent the in vitro stimulation of CCRL2 on EC (24, 25). Indeed, liver EC upregulated CCRL2 in response to LPS challenge in vivo. Interestingly, EC isolated from the lung of normal WT mice constitutively expressed CCRL2 and bound Fc-chemerin, but LPS treatment did not alter lung CCRL2 expression. Primary human EC (HUVEC and HDMEC) treated in vitro with proinflammatory stimuli upregulated CCRL2 and bound Fc-chemerin, indicating conserved regulation in primary EC across species. Liver and lung EC from LPS-dosed mice of both genotypes upregulated VCAM- 1, which is consistent with previous reports (24, 26, 39). It is not yet clear why CCRL2 is expressed endogenously at higher levels in mouse lung EC compared with liver EC, although it is well documented that EC isolated from anatomically different vascular beds are phenotypically and functionally distinct in leukocyte adhesion and trafficking mechanisms (20, 40, 41). Given prior reports indicating CMKLR1 expression and function in cultured EC in vitro (15, 42), we monitored CMKLR1 and GPR1 protein (and in most cases RNA) expression in bEND.3, hCMEC/D3, HUVEC, HDMEC, and primary mouse lung and liver EC. In all conditions tested, EC did not express CMKLR1 or GPR1 at the protein or RNA level (data not shown). Part of the discrepancy may be due to different culture conditions, which could affect gene regulation (15). However, liver and lung EC from LPS-dosed CCRL2-deficient mice did not bind to Fc-chemerin, thus indicating that CCRL2 is the primary receptor for chemerin on liver and lung EC in vivo. With its lack of classical signaling responses (i.e., cell migration, intracellular calcium mobilization) and absence of a “DRY” motif in the second intracellular loop (thought to enable coupling to G proteins; see Ref. (43), CCRL2 may be considered a member of the family of atypical chemoattractant receptors that include DARC, D6, CCX-CKR, and CXCR7 (reviewed in Ref. 44). These receptors modulate immune responses by regulating the bioavailability of chemoattractants, usually through specialized and efficient ligand internalization and degradation (44, 45). Mice deficient in D6 or DARC, for example, show increased inflammation in models of skin inflammation and endotoxemia, respectively, owing to impaired chemokine clearance (46, 47). In line with their biological function to intercept excess circulating chemokines, D6, DARC, and CXCR7 are widely expressed on numerous endothelial cell types (48–50). CCRL2 is also expressed on a variety of EC from different tissues (brain, skin, lung, and liver), suggesting a role for CCRL2 in regulating the bioavailability of circulating chemerin. Indeed, the intravascular time-integrated chemerin levels during 2 wk following a single i.v. injection of Fc-chemerin was significantly greater (by 40%) in CCRL2−/− mice compared with WT mice. This is also likely reflected in the small but significantly elevated plasma chemerin levels in unchallenged CCRL2−/− mice. Furthermore, treatment of mice with endotoxin, which upregulates vascular EC CCRL2 and enhances chemerin binding in WT mice, produced a robust 2- to 3-fold greater than WT increase in circulating chemerin levels in CCRL2−/− mice. Other examples of increased chemoattractant levels in mice deficient for their cognate receptor include CCL2/CCR2 and chemerin/CMKLR1 in a model of pneumonia (51, 52). Although a contribution of extravascular CCRL2 is not formally excluded by our studies, CCRL2 control of circulating chemerin levels most likely occurs at the level of vascular EC. Thus, in regulating the bioavailability of leukocyte attractant chemerin, CCRL2 exhibits another trait in common with the other atypical chemoattractant “interceptors.” However, one critical difference that sets CCRL2 apart from the other atypical receptors is that CCRL2 does not internalize bound chemerin, demonstrated in this study with EC and previously with CCRL2+ lymphoid cells (10). Chemerin circulates in an inactive proform and requires proteolytic processing to increase its biological activity. It is tempting to speculate that CCRL2 could bind and present prochemerin on the surface of EC to circulating serine proteases widely present during endotoxemia, thus removing the inhibitory peptides and presenting the active chemerin to circulating CMKRL1+ cells (reviewed in Ref. 53). Other surface-bound receptors such as endothelial protein C receptor are known to bind and concentrate their soluble ligand on the surface of EC, allowing for more efficient proteolytic activation by their cognate enzyme. Indeed, endothelial protein C receptor is widely expressed on vessels and binds and concentrates protein C, accelerating by 20-fold the activation of protein C by thrombin (54, 55). If EC CCRL2 captures circulating prochemerin and enhances its proteolytic activation during inflammation, we would predict 1) a reduction in circulating prochemerin levels in LPS-treated WT mice versus untreated WT controls, and 2) an increase in circulating prochemerin in LPS-treated CCRL2−/− mice compared with WT mice. Indeed, there was significantly less circulating prochemerin in WT LPS-treated mice compare with untreated WT controls, likely reflecting sequestration by EC CCRL2 during systemic inflammation (Fig. 10B). Additionally, there was significantly more plasma prochemerin in LPS-treated CCRL2−/− mice than in WT mice (Fig. 10C), along with a significant 2- to 3-fold increase in total circulating chemerin levels (Fig. 10A). Thus, our results are consistent with the hypothesis that EC CCRL2 binds plasma prochemerin for enhanced proteolytic activation during inflammation. Additional work is necessary to characterize protease-specific effects of CCRL2-dependent anchoring of chemerin in its proteolytic activation. Depending on the model, chemerin and its receptors CCRL2 and CMKLR1 can play a pathogenic or protective role in pulmonary inflammation: CMKLR1 plays a pathogenic role in cigarette smoke-induced lung inflammation (56) and CCRL2 plays a pathogenic role in an OVA model of lung inflammation (57), whereas CMKLR1 plays a protective role in viral pneumonia and an LPS airway challenge model (30, 51). Given the robust expression of CCRL2 on lung EC and the recent reported contributions of the chemerin receptors to leukocyte recruitment during pulmonary inflammation, we investigated the role of CCRL2 in CMKLR1+ NK cell recruitment to the airways in response to intranasal LPS challenge. We hypothesized that EC CCRL2-dependent anchoring/accumulation of bioactive chemerin contributes to the recruitment of CMKLR1+ NK cells to inflamed airways, an effect that should be attenuated in CCRL2-deficient mice. Indeed, significantly fewer CMKLR1+ NK cells accumulated in the airways of CCRL2−/− mice compared with WT mice (Fig. 11). There were no differences in the recruitment of CMKLR1− neutrophils or CD3+ cells. Additionally, there were similar numbers of circulating NK cells and other major WBC subsets in CCRL2−/− and WT mice, a similar expression of CMKLR1 on NK cells from both genotypes, and a lack of expression of CCRL2 on NK cells. Taken together, these results indicate that CCRL2 selectively coordinates the recruitment of CMKLR1+ NK cells in a manner consistent with our model of EC CCRL2-dependent chemerin anchoring. When bound to CCRL2, the carboxyl terminus of chemerin important for CMKLR1 signaling remains exposed at the cell surface (10). Recently, Hart and Greaves (31) demonstrated that chemerin is a potent inducer of CMKLR1+ peritoneal macrophage adhesion to VCAM-1 by inducing α4β1 integrin clustering. Thus, we hypothesized that CCRL2+ EC could bind and effectively present chemerin to CMKLR1+ lymphoid cells to trigger cell adhesion. Adhesion of L1.2 lymphoid cells to EC required the following components: 1) CCRL2+ activated EC, 2) CMKLR1+ L1.2 cells, and 3) chemerin. Furthermore, adhesion of CMKLR1+ cells was completely dependent on α4β1 integrin and VCAM-1. Thus, we propose the following possible mechanisms to describe the concerted actions of CCRL2, CMKLR1, and chemerin: 1) Direct mechanism: CCRL2 directly presents chemerin to CMKLR1+ cells and thus creates a trio with CCRL2 binding the N terminus, whereas CMKLR1 interacts with the critical signaling C terminus of chemerin. 2) Indirect mechanism: Chemerin binds to CCRL2 with an affinity typical for a chemoattactant/receptor pair (low nanomolar KD) (10); coupled with the lack of ligand internalization, it is likely that chemerin is released from the cell surface at a certain rate dependent on, for example, receptor density, temperature, pH, and salt concentration, and at some rate is reacquired by CCRL2. 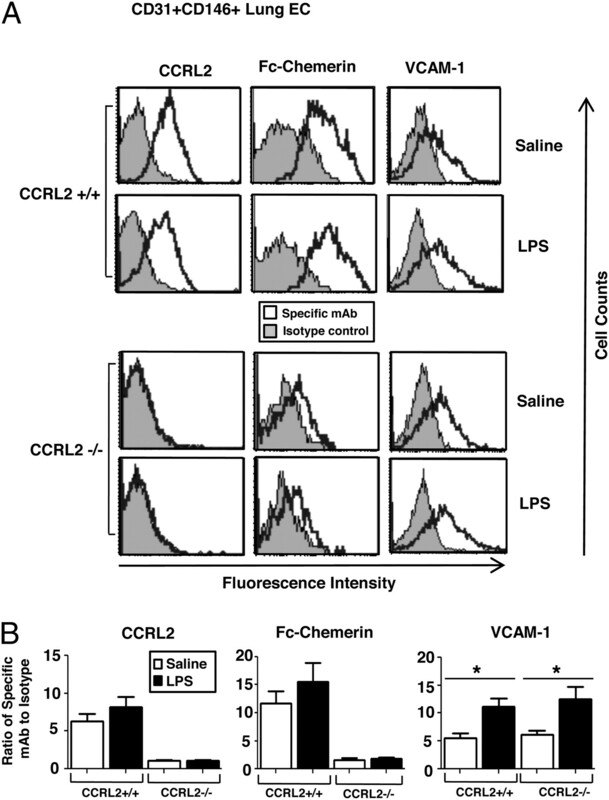 Elevated local concentrations of soluble chemerin in the media near the CCRL2 cells, however, may trigger CMKLR1 activation and, subsequently, α4β1 integrin avidity upregulation, without requiring a trio complex. In conclusion, our results provide a novel mechanism by which the chemoattractant chemerin is presented by CCRL2+ EC to trigger CMKLR1+ cell adhesion. Extracellular matrix glycosaminoglycans (GAGs) on the luminal side of the endothelium and are thought to immobilize and present chemokines to rolling leukocytes, which triggers integrin activation and leukocyte extravasation (58). In several human inflammatory disorders (multiple sclerosis, lupus, and psoriasis) in which chemerin is associated with inflamed endothelium, CMKLR1+ leukocytes (NK cells, plasmacytoid dendritic cells) are found to infiltrate into the affected tissues (11–14). Furthermore, in two separate in vivo inflammatory models, CCRL2−/− mice displayed less severe allergic inflammation (10) and less severe OVA-induced airway inflammation than in WT counterparts (57); however, it is not clear whether this protective effect is linked with a decrease in CMKLR1+ cell recruitment. Although GAGs likely play a role in chemerin binding (chemerin binds to heparin, a type of GAG), we hypothesize that CCRL2 expressed on inflamed endothelium provides a novel specific and selective mechanism to bind and concentrate chemerin (3). A recent report indicates that CCL19 may be an alternate chemoattractant ligand for CCRL2, thus widening the biological spectrum of action for CCRL2 (59). Nevertheless, selective inhibition of CCRL2 binding to chemerin, rather than inhibition of GAGs, which bind all chemokines, could be a novel targeted therapeutic strategy to block chemerin-mediated recruitment of CMKLR1+ leukocytes in chemerin-associated inflammatory diseases, such as experimental autoimmune encephalomyelitis/multiple sclerosis (13, 16). K.H. and H.T. are currently employees at LakePharma, Inc. The other authors have no financial conflicts of interest. We thank Prof. P.O. Couraud at the Université René Descartes (Paris, France) for providing us with the human brain endothelioma cell line hCMEC/d3. We thank Thomas Burke for technical assistance. This work was supported by National Institutes of Health Grant AI-079320 (to B.A.Z. ), by National Institutes of Health Grants R01 AI093981 and R37 AI047822 and a Merit Award from the Department of Veterans Affairs (to E.C.B. ), by National Institutes of Health Training Grants T32-AI07290-25 and T32-AI07290-24 and American Cancer Society Postdoctoral Fellowship PF-12-052-01-CSM (to J.M. ), and by the FACS Core Facility of the Stanford Digestive Disease Center under Grant P30 DK056339.
. 2009. Chemerin and the recruitment of NK cells to diseased skin. Acta Biochim. Pol. 56: 355–360.
. 2006. Chemokine-like receptor 1 expression by macrophages in vivo: regulation by TGF-β and TLR ligands. Exp. Hematol. 34: 1106–1114.
. 2005. Chemokine-like receptor 1 expression and chemerin-directed chemotaxis distinguish plasmacytoid from myeloid dendritic cells in human blood. J. Immunol. 174: 244–251.
. 2004. A three-step purification strategy for isolation of hamster TIG2 from CHO cells: characterization of two processed endogenous forms. J. Chromatogr. B Analyt. Technol. Biomed. Life Sci. 811: 217–223.
. 2005. Neutrophil-mediated maturation of chemerin: a link between innate and adaptive immunity. J. Immunol. 175: 487–493.
. 2003. Specific recruitment of antigen-presenting cells by chemerin, a novel processed ligand from human inflammatory fluids. J. Exp. Med. 198: 977–985.
. 2005. Chemerin activation by serine proteases of the coagulation, fibrinolytic, and inflammatory cascades. J. Biol. Chem. 280: 34661–34666.
. 2008. The genetic design of signaling cascades to record receptor activation. Proc. Natl. Acad. Sci. USA 105: 64–69.
. 2003. Characterization of human circulating TIG2 as a ligand for the orphan receptor ChemR23. FEBS Lett. 555: 495–499.
. 2008. Mast cell-expressed orphan receptor CCRL2 binds chemerin and is required for optimal induction of IgE-mediated passive cutaneous anaphylaxis. J. Exp. Med. 205: 2207–2220.
. 2009. Cutaneous distribution of plasmacytoid dendritic cells in lupus erythematosus: selective tropism at the site of epithelial apoptotic damage. Immunobiology 214: 877–886.
. 2009. Chemerin expression marks early psoriatic skin lesions and correlates with plasmacytoid dendritic cell recruitment. J. Exp. Med. 206: 249–258.
. 2008. Plasmacytoid dendritic cells in multiple sclerosis: intracerebral recruitment and impaired maturation in response to interferon-β. J. Neuropathol. Exp. Neurol. 67: 388–401.
. 2005. Role of ChemR23 in directing the migration of myeloid and plasmacytoid dendritic cells to lymphoid organs and inflamed skin. J. Exp. Med. 201: 509–515.
. 2010. Identification of chemerin receptor (ChemR23) in human endothelial cells: chemerin-induced endothelial angiogenesis. Biochem. Biophys. Res. Commun. 391: 1762–1768.
. 2009. Chemokine-like receptor-1 expression by central nervous system-infiltrating leukocytes and involvement in a model of autoimmune demyelinating disease. J. Immunol. 183: 6717–6723.
. 2010. Synovial tissue-infiltrating natural killer cells in osteoarthritis and periprosthetic inflammation. Arthritis Rheum. 62: 3799–3805.
. 2005. Blood-brain barrier-specific properties of a human adult brain endothelial cell line. FASEB J. 19: 1872–1874.
. 2001. Analysis of relative gene expression data using real-time quantitative PCR and the 2(−ΔΔCT) method. Methods 25: 402–408.
. 1993. The Peyer’s patch high endothelial receptor for lymphocytes, the mucosal vascular addressin, is induced on a murine endothelial cell line by tumor necrosis factor-α and IL-1. J. Immunol. 151: 5239–5250.
. 2006. Lipopolysaccharide signaling in endothelial cells. Lab. Invest. 86: 9–22.
. 2008. IFNγ signaling-does it mean JAK-STAT? Cytokine Growth Factor Rev. 19: 383–394.
. 2011. Protein kinase C-α signals P115RhoGEF phosphorylation and RhoA activation in TNF-α-induced mouse brain microvascular endothelial cell barrier dysfunction. J. Neuroinflammation 8: 28. 1999. P-selectin and ICAM-1 mediate endotoxin-induced neutrophil recruitment and injury to the lung and liver. Am. J. Physiol. 277: L310–L319.
. 1965. Interferon appearance stimulated by endotoxin, bacteria, or viruses in mice pre-treated with Escherichia coli endotoxin or infected with Mycobacterium tuberculosis. Nature 208: 456–458.
. 2011. Characterization of TNF receptor subtype expression and signaling on pulmonary endothelial cells in mice. Am. J. Physiol. Lung Cell. Mol. Physiol. 300: L781–L789.
. 1997. Cytokine-induced VCAM-1 and ICAM-1 expression in different organs of the mouse. J. Immunol. 158: 1825–1832.
. 1999. Anti-inflammatory drugs and endothelial cell adhesion molecule expression in murine vascular beds. Gut 44: 186–195.
. 2007. The role of ICAM-1 in endotoxin-induced acute renal failure. Am. J. Physiol. Renal Physiol. 293: F1262–F1271.
. 2009. Mouse ChemR23 is expressed in dendritic cell subsets and macrophages, and mediates an anti-inflammatory activity of chemerin in a lung disease model. J. Immunol. 183: 6489–6499.
. 2010. 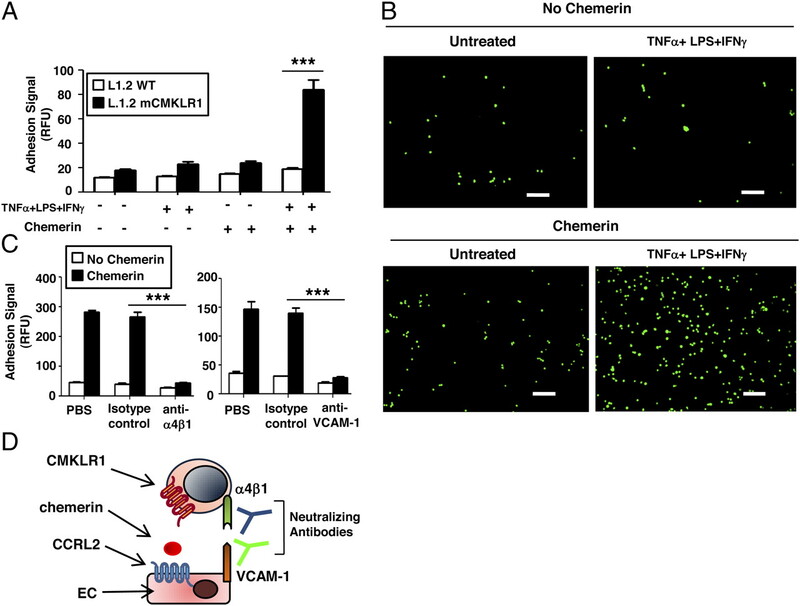 Chemerin contributes to inflammation by promoting macrophage adhesion to VCAM-1 and fibronectin through clustering of VLA-4 and VLA-5. J. Immunol. 185: 3728–3739.
. 1993. A monoclonal antibody against an activation epitope on mouse integrin chain β1 blocks adhesion of lymphocytes to the endothelial integrin α6β1. Proc. Natl. Acad. Sci. USA 90: 9051–9055.
. 1994. Borrelia burgdorferi upregulates the adhesion molecules E-selectin, P-selectin, ICAM-1 and VCAM-1 on mouse endothelioma cells in vitro. Cell Adhes. Commun. 2: 145–157.
. 2011. Effects of interferons α/β on the proliferation of human micro- and macrovascular endothelial cells. J. Interferon Cytokine Res. 31: 451–458.
. 2010. Expression and regulation of Toll-like receptors in cerebral endothelial cells. Neurochem. Int. 57: 556–564.
. 2011. STAT1-mediated signal integration between IFNγ and LPS leads to increased EC and SMC activation and monocyte adhesion. Am. J. Physiol. Cell Physiol. 300: C1337–C1344.
. 2010. Dynamic cross-talk analysis among TNF-R, TLR-4 and IL-1R signalings in TNFα-induced inflammatory responses. BMC Med. Genomics 3: 19.
. 2004. Up-regulated expression and activation of the orphan chemokine receptor, CCRL2, in rheumatoid arthritis. Arthritis Rheum. 50: 1806–1814.
. 2005. Development and functional consequences of LPS tolerance in sinusoidal endothelial cells of the liver. J. Leukoc. Biol. 77: 626–633.
. 1994. Cell adhesion molecules on vessels during inflammation in the mouse central nervous system. J. Neuroimmunol. 51: 199–208.
. 1995. α4 Integrins mediate lymphocyte attachment and rolling under physiologic flow. Cell 80: 413–422.
. 2010. Chemerin, a novel adipokine in the regulation of angiogenesis. J. Clin. Endocrinol. Metab. 95: 2476–2485.
. 1998. Cloning and characterization of a novel human chemokine receptor. Biochem. Biophys. Res. Commun. 243: 264–268.
. 2006. Tuning inflammation and immunity by chemokine sequestration: decoys and more. Nat. Rev. Immunol. 6: 907–918.
. 2010. CXCR7 functions as a scavenger for CXCL12 and CXCL11. PLoS ONE 5: e9175.
. 2000. Exaggerated response to endotoxin in mice lacking the Duffy antigen/receptor for chemokines (DARC). Blood 96: 1681–1684.
. 2005. The chemokine receptor D6 limits the inflammatory response in vivo. Nat. Immunol. 6: 403–411. 2005. Contribution of Duffy antigen to chemokine function. Cytokine Growth Factor Rev. 16: 687–694.
. 2001. The β-chemokine receptor D6 is expressed by lymphatic endothelium and a subset of vascular tumors. Am. J. Pathol. 158: 867–877.
. 2007. CXCR7 (RDC1) promotes breast and lung tumor growth in vivo and is expressed on tumor-associated vasculature. Proc. Natl. Acad. Sci. USA 104: 15735–15740.
. 2011. ChemR23 dampens lung inflammation and enhances anti-viral immunity in a mouse model of acute viral pneumonia. PLoS Pathog. 7: e1002358.
. 2005. CCR2-positive monocytes recruited to inflamed lungs downregulate local CCL2 chemokine levels. Am. J. Physiol. Lung Cell. Mol. Physiol. 288: L350–L358.
. 2006. Chemoattractants, extracellular proteases, and the integrated host defense response. Exp. Hematol. 34: 1021–1032.
. 2011. The link between vascular features and thrombosis. Annu. Rev. Physiol. 73: 503–514.
. 2004. Thrombomodulin-protein C-EPCR system: integrated to regulate coagulation and inflammation. Arterioscler. Thromb. Vasc. Biol. 24: 1374–1383.
. 2011. The role of ChemR23 in the induction and resolution of cigarette smoke-induced inflammation. J. Immunol. 186: 5457–5467.
. 2010. Nonredundant role of CCRL2 in lung dendritic cell trafficking. Blood 116: 2942–2949.
. 2004. Chemokine-receptor interactions: GPCRs, glycosaminoglycans and viral chemokine binding proteins. Adv. Protein Chem. 68: 351–391.
. 2010. Role of the atypical chemoattractant receptor CRAM in regulating CCL19 induced CCR7 responses in B-cell chronic lymphocytic leukemia. Mol. Cancer 9: 297.